In a small bowl, whisk together the soy sauce, molasses, rice vinegar, ketchup, ginger, salt, and cayenne. Once the noodles are drained, heat 1 tablespoon of the oil in a large (12-inch) skillet or stir-fry pan over high heat until very hot. Add the garlic, stir, and then immediately add the soy-sauce/molasses mixture. When the mixture is bubbling, add the tofu. Stir briefly to combine. Add the noodles and cook, stirring and tossing, until the noodles are tender and the liquid is absorbed, 1 to 2 minutes. If the noodles aren’t tender and the liquid is gone, add 1 or 2 Tbs. of water. Add the bean sprouts and scallions and cook, stirring gently, until the bean sprouts begin to turn limp, about 1 minute. Push the noodles to one side of the skillet and add the remaining 1 Tbs. of oil. Crack the egg into the oil. Scramble the egg lightly until it is almost but not completely cooked, breaking it up as you go, about 30 seconds. Fold the noodles back over the egg, add the peanuts, and stirfry, stirring gently, until the egg is completely cooked. Sprinkle with the cilantro, and serve immediately with the lime wedges on the side. Recipe is good, except it mentions adding an egg and you don't have an egg in the ingredients. You should correct this. This was very disppointing! It came out very dark. Not at all like the picture. How come yours comes out light looking when using soy sauce &amp; molassas, both very dark ingredients? I used the amount directed in the recipe.The flavor wasn't so good either. 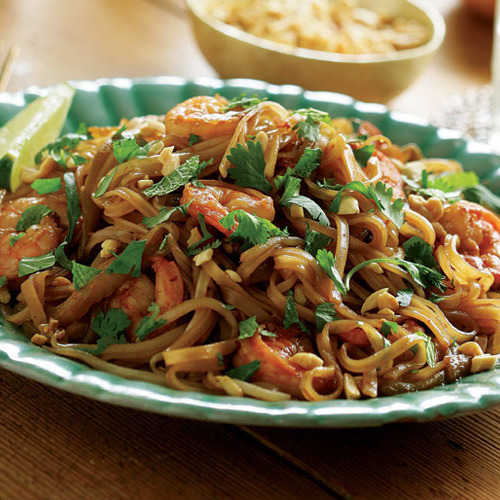 This is close to a Pad Thai recipe. 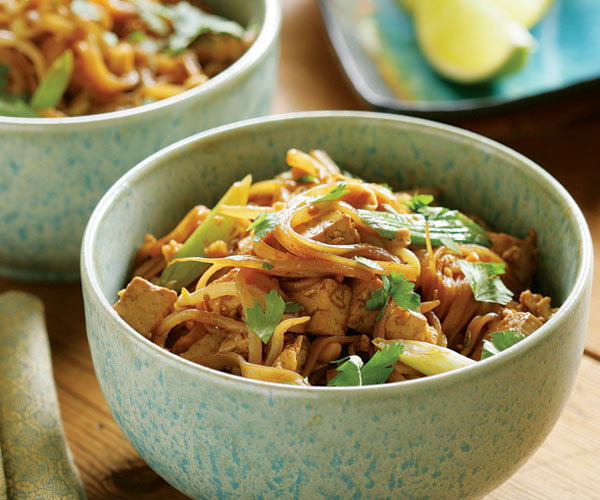 In the future I'll use a Pad Thai sauce instead of the one you suggest in this recipe. I liked the other ingredients. Just the sauce wasn't good at all. Also, the rice noodles need to soak in HOT water vs. warm for at least 30 minutes. Your recipe says warm. This temperature doesn't soften them. The rice noodle package suggests HOT tap water for at least 30 minutes.Can you tell me why this turned out very brown looking? I really love this dish. I've made it several times and it always turns out great. I don't always have tofu on hand so sometimes I substitute shrimp; they make a great addition!